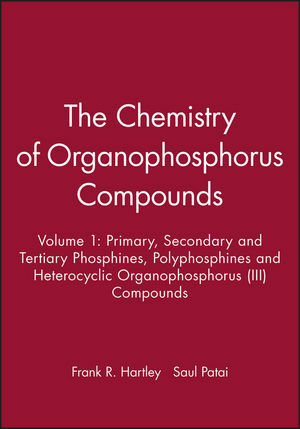 Frank R. Hartley is the author of The Chemistry of Organophosphorus Compounds: Primary, Secondary and Tertiary Phosphines, Polyphosphines and Heterocyclic Organophosphorus - III - Compounds, Volume 1, published by Wiley. Saul Patai is the author of The Chemistry of Organophosphorus Compounds: Primary, Secondary and Tertiary Phosphines, Polyphosphines and Heterocyclic Organophosphorus - III - Compounds, Volume 1, published by Wiley. Structure and Bonding in Organophosphorus(3) Compounds (D. Gilheany). Optically Active Phosphines: Preparation, Uses and Chiroptical Properites (H. Kagan & M. Sasaki). Electrochemistry of Organophosphorus(3) Compounds (K. Santhanam). Thermochemistry of Phosphorus(3) Compounds (G. Pilcher). ESR Spectra of Free Radicals Derived from Phosphines (P. Tordo). Preparation of Phosphines (D. Gilheany & C. Mitchell). The Preparation and Reactivity of Bi- and Poly-Dentate Phosphines with P-Cn-P Bonding (O. Stelzer & K. Langhans). Chemistry and Ligating Properties of Phospha-Alkynes and Their Derivatives (M. Maah & J. Nixon). Cyclic Phosphines (L. Quin & A. Hughes). Nucleophilic Reactions of Phosphines (H. Hudson). Acid-Base and Hydrogen-Bonding Properties of Phosphines (H. Hudson). Photochemistry of Organophosphorus(3) Compounds (M. Dankowski). Free-Radical Reactions of Organophosphorus (3) Compounds (W. Bentrude). Phosphine Complexes of Transition Metals (W. Levason). Biochemistry of Phosphines (N. Price & J. Chambers).